Touching down in Palawan after a few days in Kuala Lumpur we immediately looked to reset ourselves to Island time after weeks of kinetic travel through Japan. We were excited to explore these islands for the next two weeks. El Nido, which translates to “the Nest” in Spanish, serves as the primary jumping off point to the sublime beauty of the Bacuit Archipelago. An otherworldly landscape of jagged limestone islands and pristine white sand beaches greeted us along with innumerable secluded coves and lagoons decked with some of the healthiest coral reefs we have ever encountered. 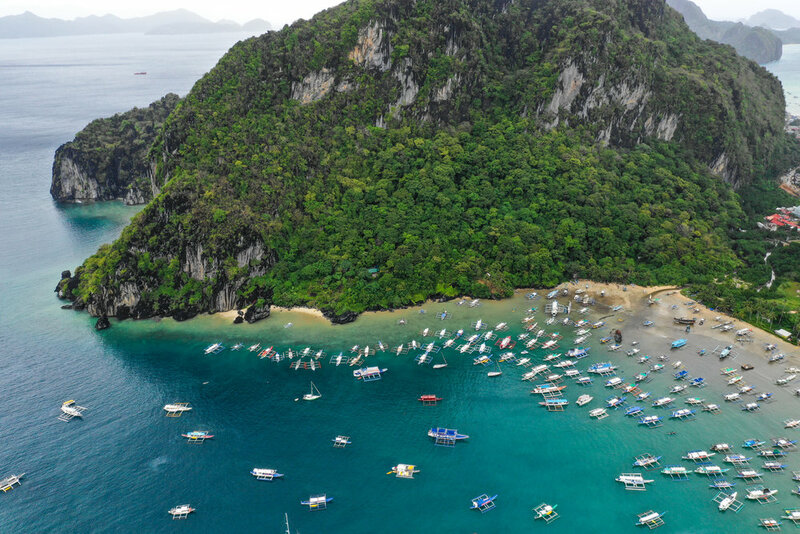 Although easily the rival of more well known and traveled destinations in Southern Thailand and Vietnam, the area has remained comfortably under the radar of most travelers. We were met outside the airport by a line of motorized trikes and took a wild ride to our hotel. Our original plan had called for one night in El Nido followed by a multi-day boat packing trip through a string of deserted islands to our final destination of Busuanga Island. However, mother nature can be a cruel mistress and we soon learned that a severely depressed tropical storm “Usman” would be arriving and all Boat/Ferry traffic had been put on hold by the Philippine Coast Guard. After a quick scramble to secure lodging, we were fortunate to settle in at the Cadlao Resort just North of town. To prepare ourselves for an impending disaster, we set out to find a local bar to ride out the rainpocalypse. As luck (and some local knowledge) would have it, we stumbled on LA PLAGE a fantastic beachside bar and restaurant owned and operated by a group of French Expats. We enjoyed and will vouch for both the house Mojitos and batches of locally sourced Moules Mariniere. Situated adjacent to beautiful Corong Corong Beach the area is host to a myriad of laid back bars, restaurants and casual accommodations. The storm had yet to fully materialize and treated us to a stunning sunset over Miniloc Island. The following few days were spent investigating the greater El Nido area. 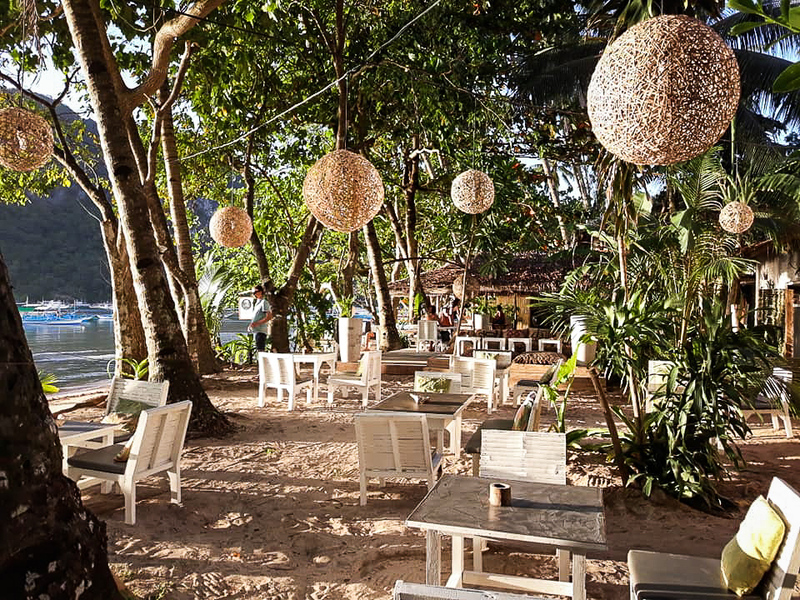 In town we recommend Happiness Beach Bar for its vegetarian-friendly options and art forward backpacker vibe. Nightlife options in El Nido are somewhat limited but all things lead to Sava Beach Bar and their excellent cocktails. 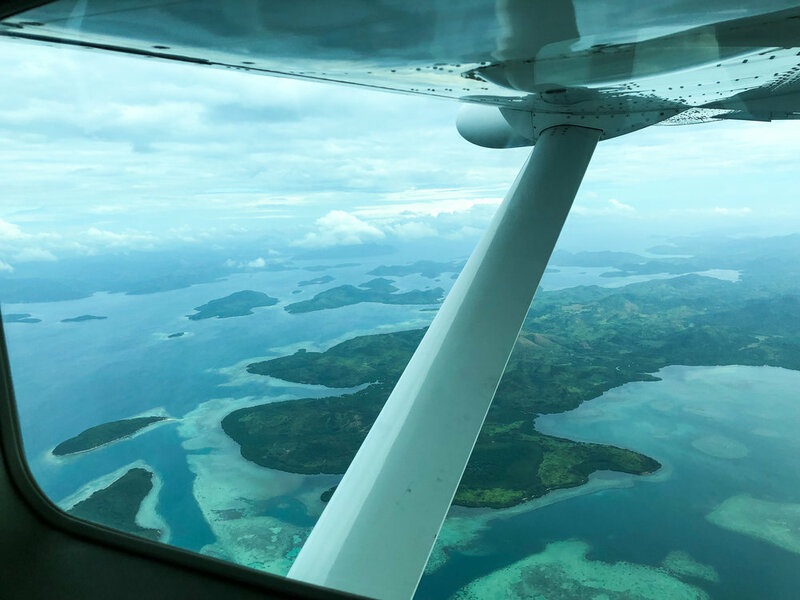 Rather than risk waiting for what could be many days for the inter-island ferry service to resume, we decided to charter a Seaplane through Air Juan for the hop north to Busuanga Island. In true Fantasy Island style, we landed at the dock of Ekhaya Busuanga Villas which was to be our home for the next week. 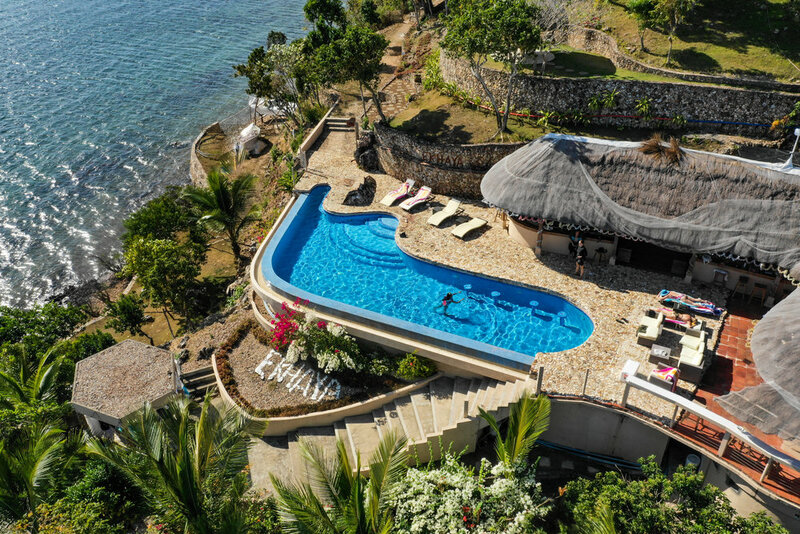 Located on the southwestern shores of the Busuanga Island, our large villa for ten, with our private pool, catered gourmet meals, outdoor spa and chill space and seaplane/boat dock was a perfect consolation to missing our island boat trip. After an amazing New Year’s Eve dinner with champagne and fireworks and a light show on the water, we spent New Year’s Day grabbing our first full day of sun, chilling in hammocks and getting massages. Our focus over the next week was all things water related as the greater Coron/Busuanga Island area offers some of the finest Diving and Snorkeling in the Pacific. Our day trip to Malajon (Black) island, took us to a rock surrounded by beach, coral and palm trees. As our boat sailed up, we were struck by the sharp black cliffs juxtaposed against the backdrop of crystal clear water and blue sky for days. Once on the island, we did some cave hiking and actually swam through tunnels in the freshwater cave. We ended the day flying our drone with local boys on another island where we stopped off for lunch. Another day trip brought us snorkeling and free diving the Luzon Gunboat and Coral Gardens. This was one of the most pristine coral reefs we’ve seen in years. 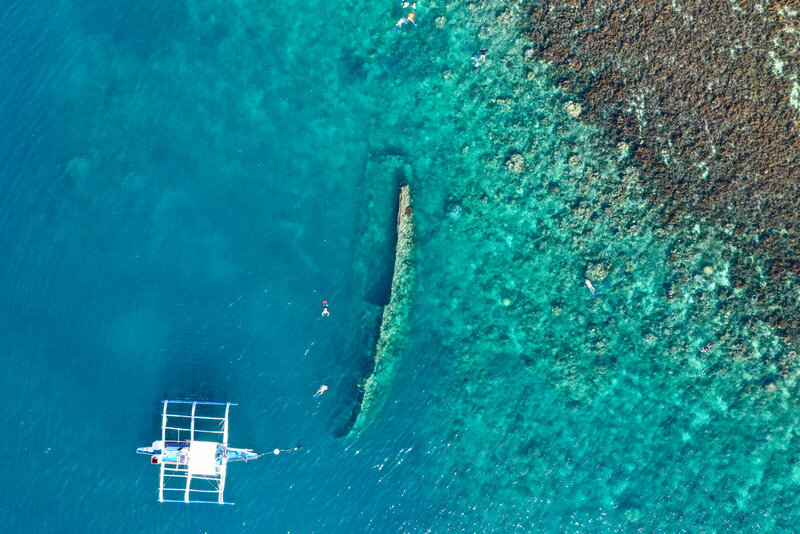 For those looking for deeper water dives the famous Japanese Shipwrecks in Coron Bay, are remarkably well preserved. We ended the day on Pass Island, with white sand beaches and mangrove trees framing the edges of the water. We enjoyed a leisurely lunch and were able to buy two cases of cold San Miguel pale ale, a rarity to find anything cold or abundant in the islands. After a week of extraordinary snorkeling, diving and general beach lounging it was time bid farewell to the Philippines.